When it came to renovating their home, Ms Celine Goh and her husband knew they wanted to transform their three-room, Build-To-Order Housing Board flat into a one-bedroom unit with an open-concept design, in a departure from the conventional layout of shoebox apartments. Ms Goh, general manager of premium piano company Steinway Gallery Singapore, had a clear vision of what she wanted for the 732 sq ft flat in Chai Chee Road: a cosy, sensuous and character-filled, yet subtly dramatic, space in which the couple can spend quality time. She engaged interior designer Ivan Lin of Aart Boxx Interior to help execute the interior design works, while also actively offering her input in design and styling. She also commissioned Thai artist Zhang Sitthi to create a hand-painted mural for her living room, which adds to the overall grandeur. The one-year renovation cost $100,000 and the couple moved in in July last year. Why did you decide on a dark palette? Ms Goh: Dark colours not only create a relaxing and cosy atmosphere, but they can also unify different decorative elements. I wanted the interior to exude a bold presence. The colour selection process was quite challenging because there were many considerations for contrast and balance. I learnt that a good mix of different textures such as wood, metal and fabric is also important, to create a sense of balance. I even replaced the main door to achieve a rusted effect and to contrast against the engineered dark wood floor I got from Wood Culture. Did you specify the use of certain materials or accessories? Ms Goh: I love wood and its enduring beauty. It offers a very inviting sense of warmth and an intimate ambience, so I incorporated a lot of wood flooring. Lighting is an important element of interior design as well because it can create the right ambience and mood, while enhancing the aesthetic appeal. I chose pendant lamps from Thai lighting brand Lamptitude. What were some space planning and storage strategies? Ms Goh: Ivan’s goal was to make the home look exceptionally spacious, despite the floor area. There is no extensive storage space in the living room. However, the bedroom wardrobe was designed such that it could house all my clothes. He recommended loose furniture pieces to offer flexibility. There is ample storage with open niches in the kitchen. We also designed an island, which doubles as a dining table and comes with storage for cooking utensils. As we love to cook, having an open-concept kitchen is a good way to integrate it with the living space. Ivan also created a space that suits our lifestyle. For example, as we do not watch TV shows, he suggested we integrate our Bang & Olufsen sound system into the feature wall instead. What challenges did you face during the renovation process? Ms Goh: One was integrating the mural artwork seamlessly into a modern, contemporary look. It took Ivan some time to think of a design concept to create a fusion between the interior and the art piece. After much discussion, we decided that the positioning of spotlights is key to enhancing the beauty of this art piece. What are some of your favourite furniture and furnishings in your home? Ms Goh: My best find is a Poltrona Frau Chesterfield sofa from Proof Living. I also got Tom Fereday dining chairs from Space Furniture to complement my kitchen island. An understated addition to my living room is a Stride rug from PDM. As for the bedroom, I chose a Ralph Lauren bed and Jaspal bedding. I tend not to compromise when it comes to comfort. Ms Goh: The bathroom. I think one of our best decisions was to combine the original bathroom spaces and create a large open-concept ensuite. 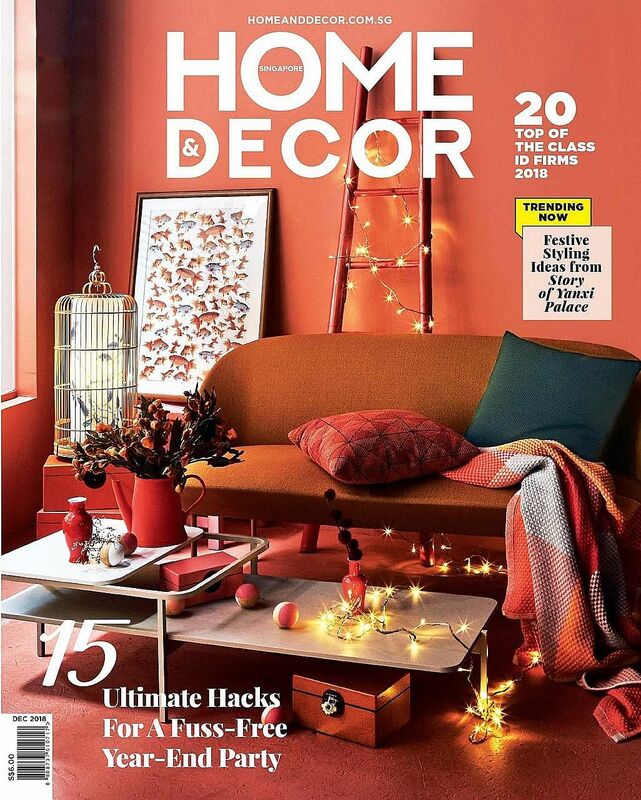 • This article first appeared in the November issue of Home & Decor, which is published by SPH Magazines.